This dissertation addresses the issue of the relation between deviant behavior in agrammatic Broca's aphasia and the theory of grammar. Agrammatic Broca's aphasics have particular difficulties comprehending semantically reversible sentences in which the canonical order of arguments have been inverted. 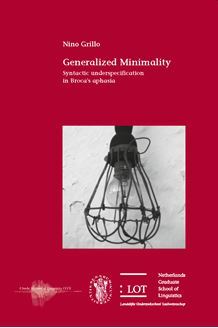 The working hypothesis is that agrammatic comprehension deficits with movement derived sentences are reducible to special cases of syntactic islands and ultimately can be explained as a minimality (in the sense of Rizzi 1990, 2004b) effect generated by an underspecification of the morphosyntactic featural make up normally associated with syntactic categories. This impoverishment is attributed to a syntactic specific processing deficit which allows for a partial recovery of the full feature array needed to distinguish between a moved element and any potential intervener. The under specification hypothesis is extended to comprehension and production deficits and, on this basis, parallels between deficits with movement and binding are drawn. Particular emphasis is given to the analysis of passives. Following Gehrke and Grillo's (2007, 2008) analysis of passivization as an operation on the event structure of the predicate, a novel approach to comprehension difficulties with passives in language acquisition and breakdown is discussed. Experimental data on production (originally discussed in Garraffa and Grillo 2008) of wh questions in Italian is also discussed. This work is of interest to scholars working in the field of language breakdown, language acquisition as well as to linguists interested in the syntax of movement, locality and passivization.